New Delhi: The White House announced on Monday that US President Donald Trump has had to turn down India's invitation to participate as Chief Guest at the 2019 Republic Day celebrations in the national capital New Delhi due to "scheduling constraints." Worth mention here during their talks in Washington last year, Prime Minister Narendra Modi had given the invitation to US President Trump for a bilateral visit to India. 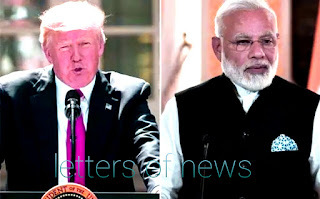 The WH spokesperson told the news agency PTI that President Trump has been committed to extend the India-US ties and asserted that both Trump and Prime Minister Modi "shared a strong personal rapport." The spokesperson said, "The President is enjoying a lot. strong personal rapport with Prime Minister Modi developed through two meetings and many phone calls and remains committed to deepening the US-India Strategic Partnership Prime Minister Modi again at the earliest opportunity. " It is noted that the two world leaders are programmed to be present at the G-20 Summit in Argentina on November 30 and December 1, where it is likely to happen.